Try Texas-Style Burgers at your next cookout. Texas-Style Burgers are flavored with steak sauce, onions and green chiles for big Texas flavor. 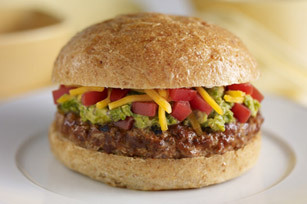 Mix meat, 1/4 cup steak sauce, onions and chiles; shape into 6 (1/2-inch-thick) patties. Grill patties 5 to 7 min. on each side or until done (160°F), brushing occasionally with remaining steak sauce for the last few minutes. Serve in buns topped with remaining ingredients. For added color and texture, serve with a mixed green salad tossed with your favorite KRAFT Dressing. Prepare using A.1. Bold & Spicy Steak Sauce.